Media Size Choose an option24" x 28"32" x 37"
Authentic perfection is the selection of legendary warriors. Heritage and performance continues with these mighty American made heavyweights. First off the production line in its signature red is the new Indian Chief Vintage, with the same look and feel of the historic classic. Alongside rides the mid-40’s Chief, whose sheer power allows you to soar with the eagles as you feel the force of the open road coursing through the well-crafted machines. 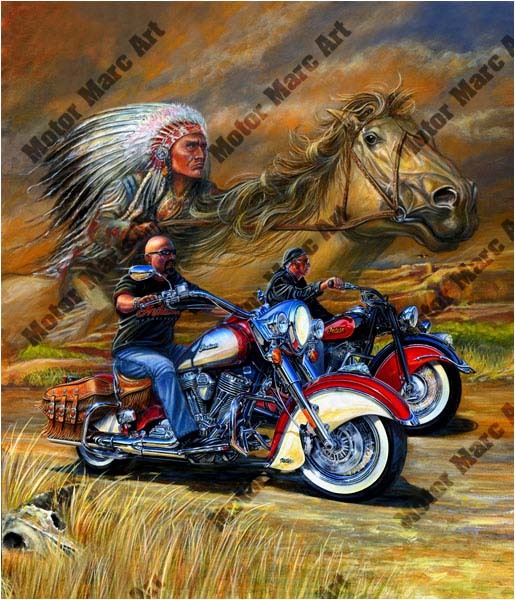 The great spirit of the Indian Chief is depicted as the two riders seamlessly float on the element of wind which speaks of riders past. “Motor” Marc connects the strength of the natives with the power in these iron horses. As a native himself he has utilized the abilities of the wind, sky, and land, to draw your attention to these uniquely designed motorcycles. This officially licensed limited edition work-of-art will impress true Indian motorcycle enthusiasts, uniting them with an era gone by. 24" x 28", 32" x 37"